A member of the Louisville Orchestra, Heather Thomas was previously an Academy Fellow with the New World Symphony in Miami, FL. Among many concert highlights, Ms. Thomas was privileged to serve as concertmaster in an un-conducted performance of Dvořák’s Serenade for Strings with members of the Tanglewood Music Center Orchestra and to serve as concertmaster under the baton of Nicholas McGegan in Beethoven’s Symphony No. 4 with the Music Academy of the West Chamber Orchestra. 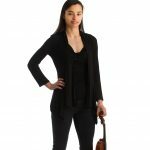 She has also enjoyed stints as both concertmaster and principal second with the New World Symphony and Tanglewood Music Center Orchestra, and has performed the world premiere of GutTransparencies by Ted Hearne, As Once on a Deserted Street… by Martin Boykan, and a performance of Deep Red by Bright Sheng conducted by the composer himself. Ms. Thomas received a Bachelor of Music with Sergiu Schwartz from Columbus State University’s Schwob School of Music and a Master of Music with Kathleen Winkler from Rice University’s Shepherd School of Music.